On November 22, 2004 U2 filmed the video for “All Because of You” riding on a flat bed truck winding their way through Manhattan. At the end of the day a “surprise” concert was held in Brooklyn, New York, at Empire-Fulton Ferry State Park. The concert was filmed and portions of it were broadcast for an MTV special. During that concert U2 performed eight tracks in the main set, and three in the encore, including doing “Vertigo” at the start and end of the concert. The main set list was “Vertigo”, “All Because of You” (released here), “Miracle Drug”, “Sometimes You Can’t Make it On Your Own” (released here), “City of Blinding Lights”, “Original of the Species”, “She’s a Mystery to Me”, “Beautiful Day”. The encore was “Out of Control”, “I Will Follow” (released here), and “Vertigo” (released here). The band played to an estimated audience of 5000 people. Four tracks taken from the concert were released as a digital only EP on the iTunes music store in the USA. The EP was titled “Live from Under the Brooklyn Bridge”. The tracks were initially released on December 9, 2004. They were initially released in 128kbps quality on the iTunes service, and these tracks were never upgradable to a higher quality under the iTunes Plus program. The songs on this live EP, as of early 2009 are no longer available in the iTunes store. The only “art” attached to these files is a low resolution photograph taken under the bridge during the concert. 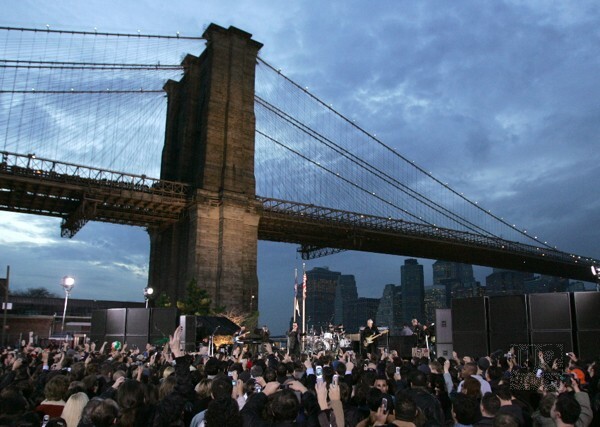 The cover art shows fans gathered under the bridge with U2 performing. The photo is not even cropped to the typical square format for covers, and is instead left in the shape of a photograph. Other tracks from the performance were released on singles in 2005. “She’s a Mystery to Me” was released as a b-side on the “All Because of You” single in the UK, Europe, Australia and Japan. “Out of Control” was released as a b-side to the “City of Blinding Lights” 3-Inch single. “City of Blinding Lights” was released as a digital single on iTunes in Europe and Australia. The other tracks have not been released at this time. The MTV special that was broadcast showed the opening version of “Vertigo” (not the one found on this EP), “All Because of You”, “Sometimes You Can’t Make it On Your Own”, “City of Blinding Lights”, “She’s a Mystery to Me”, “Beautiful Day”, “Out of Control”, and “I Will Follow”. The footage from the show was intercut with footage from throughout the day filming the “All Because of You” video. No traditional liner notes in this digital only release.